When you are considering offering employment in your boarding cattery, you should consider the benefits of hiring older people. Many older people would welcome the opportunity of part time jobs and they can be most reliable and trustworthy. There are many older people who would be only to happy to work on a temporary basis. If you only needed to offer employment during the busiest months of the year, you could find that this arrangement will suit an older person very well. Many older people do not want to take their annual holidays when the schools are on summer holidays. They prefer to holiday out of season, so during your really busy months they would be happy to work. 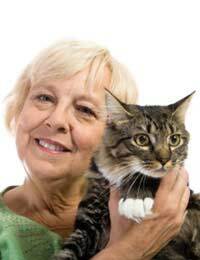 Perhaps if you find reliable employees among the older age group, you would feel confident enough to leave them in charge of the cattery at times, and give yourself some time off. A big advantage in employing older people is that you could probably call on them at short notice. If, for instance, you were unwell one morning, they are more likely to be able to drop everything and come to work with very little notice. They probably have no dependants living at home and can please themselves as to the hours and days they are able to work. This arrangement could work well for you as they would probably be willing to work weekend shifts where younger people would not want to. One of the main advantages in employing an older person is their reliability. On the whole they will feel more loyalty towards you as their employer than perhaps a younger person would. An older person will have more experience of the working environment and usually will have the right attitude to work. If you employ an older man, he will in all probability be willing to undertake small maintenance tasks for you in the cattery which would be very useful in the day to day running of your business. It is always handy to have a strong arm to help with the lifting when your supplies are delivered. The major disadvantage would be health problems, but many older people are as fit as a younger person. They may be a little slower in their work, but will more than likely compensate for this with thoroughness and commitment. It is an advantage to have a quiet, slightly slower approach when dealing with cats. As with any employee it is good to have a friendly but professional relationship with older members of staff.